Here is a super easy recipe that I would love to share with you to make for a special occasion. I think that this would be the perfect recipe to make for Valentine's Day. You could also add rice and a vegetable for the perfect dish. Don't forget that glass of wine too! Preheat broiler. Cut the shells open lengthwise down the back. Brush meat with olive oil and season with pepper and lemon. Place in a pan with opening facing upwards with lemon juice and water in the pan. Broil tails for 5 to 10 minutes until lightly browned and lobster meat is opaque. Done. Enjoy! Note: I broiled my lobster tails for 10 minutes since they were large. You can also melt butter to dunk the lobster in. I hope that you try this recipe and the best part is it's done in minutes. Looks so delicious! I can tell you are an excellent cook; I will visit much more often! That is the sort of thing I would enjoy cooking for Valentines. Yum! Loved this delicious recipe, Julie. Absolutely perfect for Valentine's Day! Thanks for sharing it! Sounds yummy and so delicious :-) thanks for linking up to the weekend blog hop Julie. .. I always have to click on a recipe for lobster, it's one of my favorite foods. Being from South Florida I am always looking for new recipes to enjoy our tails. I have never cooked lobster, this would be so fabulous. Stopping by as co-host of Homemade link Party. Looks delicious and seems super easy to make! I've never tried to cook lobster before! These look really good and thought it was a great idea for Valentines DInner (we don't like to fight the crowds). Pinned. Stopping by form the Happiness is Homemade party! Wow, nice! I feel fancy just reading this recipe! Thanks for sharing it at Snickerdoodle sunday. These look delicious, making my mouth water. Thanks for sharing with us at Wake Up Wednesday Linky Party. Sounds amazing! Thanks for sharing at Share Your Stuff Tuesdays! YUM! We love lobster! I have only boiled it. Will try this for sure next time. Thinking I might just go get us one for Valentines. Thanks for sharing with SYC. This looks so yummy. 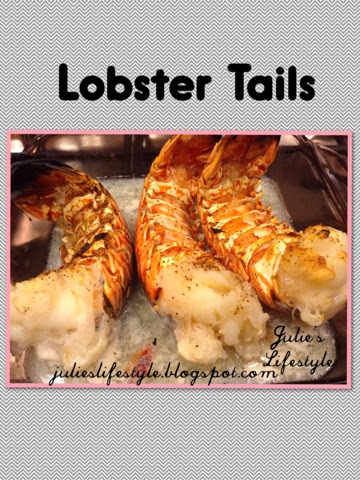 I've never made lobster tails because I thought they would be very complicated. But by the looks of this recipe, I was wrong. These lobster tails would definitely be a wonderful Valentine's Day meal. Wish I'd had them tonight for dinner! Thanks for sharing at Inspire Us Thursday on Organized 31. I love lobster and this would make a great Valentine's meal at home! Thanks for sharing at TTF! Thanks for the recipe Julie! I had no idea how to do this! My husband would love these. Have a great week! Julie, these look and sound delicious. Thanks for sharing your recipe. These look delicious for New Years eve!! Thanks for stopping y to Link on Friday Features this week. Wishing you a Happy New Year!!! This is a neat recipe! Thanks for sharing your recipe with us on The Art of Home-Making Mondays! Yum. My hubby would love eating this for a special dinner. Thanks for sharing on Merry Monday. I've never had or made lobster tails. Thanks for the recipe in case I ever do! My husband would definitely like them! Thanks for linking up to the Bloggers Brags Pinterest Party. I have pinned this post to the Bloggers Brags Pinterest Board.